This entry was posted in Just Life on February 8, 2016 by Steve Tilford. While watching the Superbowl last night, I noticed how many of the players thanked god almighty for the opportunity to get paid zillions of dollars to play a game. Seems pretty reasonable. They sort of won the lottery, minus the CTE (Chronic traumatic encephalopathy) and other life long injuries most of the players end up with, but they probably do owe someone a prayer. Also, there was the Church of Scientolgy Super Bowl ad. Anyway, it got me thinking about how I was raised and how I got to my views on religion. My parents were both Episcopalians. 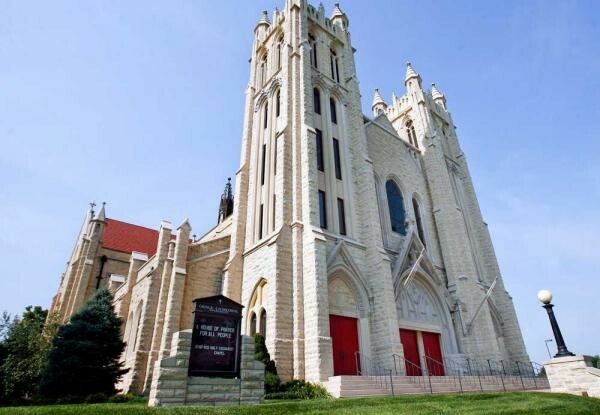 There is a cathedral, Grace Cathedral, in Topeka and that is where I went to church. On Sunday’s, I wasn’t much into church compared to running around, climbing in trees, or riding my bike. One Sunday morning, maybe when I was around 7 or 8, I think after my parents had a hard partying night, I remember my mom walking out to the front yard where my brother and I were playing and asked if we wanted to go to church anymore. We thought it was a trick question. We said we were fine just playing and that was the end of it. It was like getting a continuous summer vacation. Flash forward a couple more years and it came time I went to confirmation. There were classes at church, but I didn’t have any interest. I didn’t memorize the Lord’s Pray and was flunking. So my mom had a chat with the cannon, who happen to live just down the block. It seems that they were taking a long family vacation, like over 2 months, and they needed someone to dog sit their golden retriever, Chandler. So the deal was that we would take care of their dog and I was to be confirmed. I think there was an implication that I would learn everything about confirmation later on. I was a kind of ambivalent towards religion up to this point. This deal was the tipping point. And throughout life, I realize these “religious deals” happen all the time. Doesn’t seem like god would approve of personal deal making superseding religious “rules”. I’m pretty okay with my beliefs. I say all this, but wear a St. Christopher medal that my mom gave me. It has the Lord’s Prayer on the back. And when my pets pass, I pray that their spirits are as free after death as they were when they were alive. I guess we all use some method to meander our ways through life. It might not be an organized or recognized religion or anything more than a thought, but whatever you call it, it helps us navigate through this complicated situation of life. 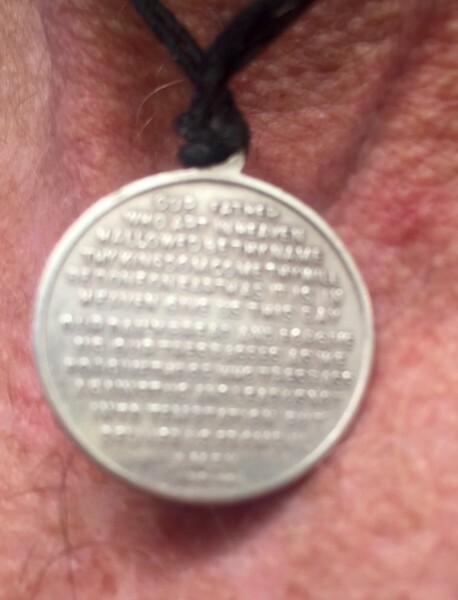 My St. Christopher medal has the Lord’s Pray on the back. Pretty small writing. 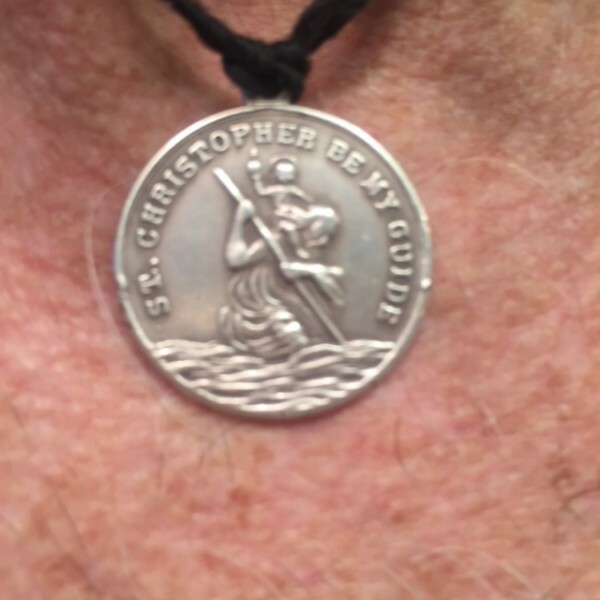 St. Christopher is the patron saint for travellers. That was a cool story. Thanks for sharing it. …of all the profound things you continue to say in this blog, this one was very prescient. My mom became an Episcopalian in the 70’s, and my brother and I just sort of went along for the ride. We quit regular church early in the 80’s, though we did get through Confirmation classes. I was a bad fit for the Dallas preppy scene, and was once beat up in the bathroom. On a Sunday. After Confirmation classes. I remember thinking that of all the ironies – THIS? I didn’t return to that church until I think my brother’s wedding, his kids’ baptisms, and my pre-marital counseling. But I have found the good in being an Episcopalian. I went through Episcopal Schools, and found my own spirituality independently. Having a church in Montana to attend gave me friends and extended family outside of college, and maybe 8 years ago, an Episcopal Priest became a client of mine, and I later joined his church. The current pastor also rides. I go maybe once a month, maybe every other month, and while I like the message and the ritual, it’s really just a time to reflect and inflect on things, think about stuff I can change, people I need to reconcile with, learn how to handle my own anger and issues. There’s just no pressure. No, “Good morning Brother, I’m saved, are you? !” Stuff like that. They don’t care if you don’t show up. When you’re there, they appreciate you and your presence. I’m also really proud of their focus on education, focus on the current needs of now, and the hesitancy to pass judgment. I know Episcopalians get rapped for being too ‘soft’. I think it’s more an attitude of ‘Open’. I mostly like it, and it works with my questions about life, religion, family, good, and evil. I like the message and the ritual, it’s really just a time to reflect and inflect on things, think about stuff I can change, people I need to reconcile with, learn how to handle my own anger and issues. This is the ideal, regardless of the kind of belief system adopted. I’d have a much more positive opinion of religion if this were the common practice. A few demagogues really poison the well for me. Not to be forgotten is the social community that churches provide. Very important stuff! The book “Bowling Alone” covers modern American social changes pretty well. It might be a little dated by now. Nice. I did not grow up with religion — in fact quite the opposite — but as I’ve aged, I’ve gotten more spiritual by quite a mile (albeit still avoid organized/specific religion). I’m sure you know the pastor Tobias Schlingensiepen in Topeka and I always say if I ever for some reason find myself moving back to Kansas, I’d go to his services on the regular, as he embodies very well what I would look for in a ‘religious person,’ which is to say that he is a smart, worldly and compassionate individual. @jeffc That is a fun movie. For many of us who now regularly go to church as adults, there was usually at least SOME significant (IE, long) period of non-attendance, questioning of faith, denying of faith, exploration of other faiths (or our current faiths) before we returned. It’s amazing to me how much sense it all makes now that I’ve actually done some living. Known some true suffering, trials and tribulations. Done some damage to others, etc. The gift my parents gave me in many years of weekly attendance, was having something good (wonderful, actually) to come back to. For me, it’s a very cleansing, serious and important reset button. I never leave feeling angry or upset. Quite the opposite, actually. And I can attest to this. Church today, is not the church of the 60’s and 70’s. You’ll probably have more agreement points on what’s being said than not. Technology has made it easier to have a personal relationship with Christ. That isn’t to say that the community you find meeting others in Church isn’t important; but honestly, as a non-believer or new-believer it can be intimidating and/or overwhelming to step into a church for the first time, or first time in a while. Especially when the pastor is using all sorts of words and jargon that seem completely normal to the people who have attended Church for decades, but are entirely foreign to those who haven’t. With today’s technology, you can “go to church” on the internet at places like live.life.church or you can watch messages in demand (like at http://northpoint.org/messages/ or http://www.life.church/watch/). The pastors at both of those churches are really great communicators, teach very biblically, and focus on the real message of Christianity — it’s not about following rules or being more holy than others, it’s about love and relationships with Christ and with other people. I’m glad you posted this, Steve. If you are ever interested in talking about this in person at a race, we can grab some coffee afterwards and chat. See you at the starting line. I think you meant “they get raped for being too soft”. No? Organized religion can be a turn off for a lot of people. It can make you feel self conscious, and they sometimes act holier than you. That is BS and you shake it off. A church is a hospital for sinners and hurting and broken people. Not a country club for saints. Bottom line is I believe in intelligent design. It is really all about a personal relationship with God and accepting Jesus as Lord and Savior. Churches and religion and rules and ceremony and rituals come after that. I used to say ride the pew in the morning, ride the bike after that. Steve, when you pray for a deceased pet, who or what do you pray to? Last summer I was invited to Montana (road trip) by my cousin, a fundamentalist Christian. I had to listen to her quote the bible obsessively, for extended periods of time during the entire trip. That’s ok, because I’m a good listener. I was there a week, and she invited me to her Sunday church service. I wanted to be a courteous and respectful guest, so I went, even though I don’t embrace at all belief in God as a higher power etc. Honestly, the pastor in the church came across like he was some crazy man speaking to cult followers, and my cousin came across as completely obsessed with the bible, since we could have no discussion about any subject whatsoever, without her responding with “what the scriptures say.” The pastor spoke only of the rapture, the revelation and how if we don’t accept God now as our personal savior, we’re going to hell, and gave detailed descriptions of both the process and what it’s like there. I mean really? A pastor giving this speech to hundreds of people, who were also standing up yelling praise god and all that? How can any normal person take that seriously?? Barb, your decisions to take the road trip and attend a church service both fall into the “personal responsibility” category that you claim to own. But then you whine about the consequences of those choices…that you made. Grow up, FFS. No one asked for your criticism or judgment, and no one was whining, not that I owe you any explanation, FYI, I hadn’t seen this cousin since childhood (like more than 40 years ago) and, re-connected at my mother’s funeral, and didn’t know she was a freak when I accepted the invitation and went on the road trip. As for going to her church, I DID IT FOR HER, not for me, and offered an OPINION about the people there, they sounded like crazy people. How is that “whining?” Please DO NOT reply again, you’re just using some flimsy excuse to ATTACK, and that isn’t what this forum is for. I can understand why your handle is “Dark (rain)Cloud for cryin’ out loud. By the way, when I referenced being “bombarded” with others’ religious beliefs, I wasn’t referring to my cousin. I was referring to the entire country of fundamentalists, who force their belief system on others with impunity with every opportunity. This has been my overwhelming experience for decades, and is getting worse, now that politicians know how to manipulate the masses of the brainwashed. I accept responsibility for my “decision” and “consequences” for the past 30 or so years to limit my exposure to people like this, and to AVOID these people at all costs, and my consequences are completely acceptable for me. The deal with my cousin was a once in a lifetime event, with no prior knowledge she was suffering from extreme OCD with the bible stuff, so no, you can’t use that as a battering ram to shoot me down. I DO accept responsibility for my decision to avoid people like this, and the only thing I “whine” about is that strangers DON’T GET THAT I DON’T WANT TO HEAR THEIR UNENDING SERMON and FORCE IT on me anyway. I came to read the comments. I ended up at the Church of Barb. Read the link before putting foot in mouth and attacking people. I’m not the only one in America who is sick of the religious fundamentalism running rampant in our country, which you conveniently label as “whining” because you don’t respect other’s opinions or choices either.. Fundamentalist Christians are almost as bad as ISIS when you really look at the mentality that drives fundamentalism, and the complete lack of tolerance or respect for those who don’t embrace their beliefs. Read about it, or are you too narrow in your life view, to consider any view but your own? Anyway, I’m done with this, not going to get into some long drawn out debate over this issue. Not sure why religion was even introduced into what I thought was a cycling blog, because it always stimulates argument, and I’m not into it. I wasn’t the one who introduced the topic of religion, and I don’t see you criticizing anyone else’s comments along the same lines. In fact, based on today’s topic, I would like to unsubscribe from this blog, if I could just figure out how to do it. There’s no way to do it that I can see. I really don’t want to follow blogs that discuss religion, because they will inevitably be dominated by people who attack others with differing views for voicing an opinion based on a topic I didn’t choose and that is well-known to stir up conflict and controversy. Religious people are the worst too. No tolerance at all for anyone but people who think like them and accept their belief system. I’m here for cycling posts, not religious lectures and sermons, and to be criticized. Reading today’s post reminded me of riding my Western Auto 20″ bike (courtesy of an uncle) in the dark to 6:00am mass to fulfill my altar boy duties. Thanks. Barb, you engaged. You “chose”. Your (many) posts today are filled with piss ‘n vinegar due to the anger YOU freely choose to stir. You have no right to direct the wanderings of Tilly’s mind. Only the right to choose not to indulge it. Now, by looking at the number of responses, I hate to break it to you, but if you ride bikes in the USA, you’re probably doing so surrounded by plenty of theistic people (as well as agnostics and atheists). As far as getting off-topic about cycling, I’ve never seen you get pissy about new puppies and fixing roofs. And for the record, you seem to have made some very naive assumptions on dogma. Not all of us assume the pre-prepared archetypes of religion that seem to drive your misguided perceptions. And again, just for the record, there’s no “unsubscribing” from this blog that you have always freely navigated to in the past. Your only option is to avoid reading it. My initial posts were not “angry” just relating my experience. I didn’t get full of “piss and vinegar” until people started attacking me, which I consider your reply in that category also. There is nothing controversial about puppies or fixing roofs, no one lectures or gets into heated discussions about those subjects, so using them as a comparison is also off base. Any other digs and jabs you’d like to hurl now? If Tilford wasn’t inviting comments, it wouldn’t be a blog, and there wouldn’t be a provision on the blog for people enter THEIR comments. It’s ok for those following to enter their stories about how they were saved by God, but it isn’t ok to enter comments that aren’t in agreement. Not to mention, I never said anything about my experiences being about “everyone’s dogma, I said I object to those who are OCD about their faith and continually force it on everyone around them, which I consider disrespectful. You lumped that specific reference in with YOUR idea of how I see ALL people’s faith, and that isn’t what I said. Now stop throwing rocks. Paragraph breaks. Get to know them. Now we’re really getting to the nitty gritty of the issue when people start attacking paragraph and sentence structure. Don’t you guys have anything better to do? I feel like church is too homogenous these days. One brand of people are accepted with little to no tolerance for any different flavor. Seemingly, there’s no room allowed for any slight differing of opinion. You believe the hard line that’s being sold or you’re not fully accepted. Your political beliefs must be a certain direction and fear has to be your motivating factor for attendance. I wish religious organizations that sought the example of Jesus, lived by it. Why don’t more churches help the community? Maybe even portions of the community that their suburban lifestyles wouldn’t dare darken otherwise. Regardless, it makes the whole enchilada hardly worth it. It’s too much of an affluent white country club set. There’s nothing further from the authentic biblical example. I’m simply stating modern churches could ease up on politics and guilt/fear mongering and love to serve others. With that priority, church and religion could be more relevant. This is the nicest thing you’ve said to anyone the entire day. Theys lots of different churches. Here in Az, everyone seems to be making their own nowadays. Barb, perhaps a call to a mental health hotline is in order. You need help. Anyway, I’m done with this, not going to get into some long drawn out debate over this issue. I can understand why your handle is “Dark (rain)Cloud for cryin’ out loud. That coming from a “barb,” as in the painful point of a fish hook. Jeez Barb, thanks for finally hit’n the brakes! I know the religion thing got you all stirred up ( probably from childhood memories) but just chill out. Think of the grand big picture, the infinite scales of dimension of time and space. And how small we are on this teeny tiny planet. Our whole history of life on this planet is but a speck in time, a speck in space. Think about it. It will relax and calm you. Just think how great our world would be if everyone followed the Ten Commandments! Give it some thought. There’s only void… and nothing but the void. As some Native Americans believed and Sturgill Simpson sings about; the Earth is actually the back or the shell of a turtle…Its turtles all the way down…. “So whatever you wish that others would do to you, do also to them, for this is the Law and the Prophets. Mathew 7:12. I think for most of us that prohibits pedophilia. Wouldn’t the pedophiles have been following Mathew 7:12 if they wished to be sodomized themselves? So they really were adherents to the text of the good book – although I’m sure that doesn’t give any consolation to their victims. I think the great majority of human beings would say that this act is abhorrent and unacceptable. But when you introduce religion into the mix on this issue, the religious seem to lose their bearings. As an example, look what happened in Pennsylvania. Two sets of repugnant behavior. One in the catholic churches of Philadelphia and one in the showers of the Penn State locker room. In which case was there unanimous outrage, swift punishment and significant repercussions for the organization? Why was the response between the two so different, considering the extent of the abuse for one was just a fraction of the scale of the other? Humans (by nature) do a very bad job of following the commandments. The whole point of getting together in this organized way is that we acknowledge that we can’t / don’t. We acknowledge that we’ve got flaws. Inherent flaws. The kind we’re born with. There are plenty of people who’ll tell you that you need to get (and stay) on “the right side” for salvation (as if they’re somehow “on it” themselves), but you should pay little mind to those charlatans. Fact is, there are very few completely righteous human beings (if any exist at all). If you’re putting your faith in man (church leaders, self-proclaimed righteous beings, whatever), you’re being taken for a ride. Humans will always want what they can’t have. No one ever has been able to follow the 10 commandments nor ever will because we are not perfect. One notable exception. Jesus Christ who was fully God, explains why the tomb was empty, He rose on the third day. I’m typing this slowly so that you can understand. They often did things to others that they wanted themselves. That does not make it right. Really, I can think of millions that have and they did it without trying. How about all children that died before their 7th month. Its actually not that impressive that he rose from the dead as many others did that day as well according to the good book as it describes them walking around and greeting people. What is interesting is the the authors of the book did not think it was note worthy to follow these folks around and describe what they did and where they eventually went. What is funny is that the Jews actually met and lived with Jesus and said “no, this isn’t the guy”. Two thousand years later you read a book (written by men who were not alive during the same time period as Jesus) and say this guy is god. How the heck did the Jews miss it – especially since they were looking for the messiah – and you figured it out by reading a book (a few versions removed no less)? I read the book and thought is seemed consistent (not the book itself as it is often contradictory) with one written by some early humans who didn’t have much of an understanding of how the world worked. Fortunately we have figured out quite a few things in the interim. Well, some of us have. Krakatoa East of Java come on now. You say “I think the current generation of secular humanists are quite lacking in basic humility.” yet earlier in the SAME paragraph you write “I believe very few things with total confidence. One of them is that there was some kind of intelligent (IE, not random) effort behind whatever has led to my existence.” Let me get this straight, the sun, the moon, the stars, all life before you, etc. were part of the grand plan that led to you!! You should really start teaching those humanists some lessons in humility – insert eye roll here. Yes Dave all unborn babies would be in heaven since they have not sinned nor the chance. Good point. Jesus was the first fruits and responsible for raising many at His resurrection. He will also raise many at His return. As to how could the Jews not recognize Jesus as the promised Messiah when they were looking for Him and may have talked to Him. Well many did recognize Him as the Messiah, not all of course but many did believe. The fact that many did not believe back then or donot believe today does not mean Jesus is not the Messiah. It just means some donot believe unfortunately. I’ve long been hesitant to speak on behalf of others (or to appear to do so). With your permission, I’m happy to change “my existence” to “OUR existence”. I never said (or meant), that I (or we) are the grand, end-all result, or the most important development of the process. I make no claims of importance on behalf of myself or others. I just don’t believe that we’re all just a grand random accident. Simple as that. If you want to run a hostile opposition to what I’m saying, I’m sure you can find a witty (perhaps sarcastic) way to go about it. And I’ll even give you this: I don’t think atheism is an illogical conclusion for people to make. It’s just not the one I choose. We all think differently. “The Jews” of whom you speak didn’t exactly hold an open election on the question of Jesus. He and his twelve disciples were all Jews, and most of the people that came to call him the Messiah were also Jewish. And there were plenty OF them. Jesus spent most of his three years of ministry out and about in the countryside. Small villages. He was usually on the road. The thing is, the Jews that counted most (in the eyes of the Romans) were the urban Jewish leaders of Jerusalem. They didn’t exactly get to (or choose to) spend a lot of time with him. When they arrested him and brought him to the Roman leadership, instead of putting on a show for their benefit, he kept it real. He didn’t answer to them, because he didn’t need to. Yancey, I’m guessing you haven’t actually given that statement much thought. Sure, based on copies of copies of translations of translations of books that no longer exist. Amusing that there is no contemporary mention of the Jesus character anywhere outside of the Gospels. I know, the Bible is true because the Bible says that the Bible is true.